Bathing Suit Season is here! I've been loving looking into the hottest trend of the season and then coming up with cute options for how to wear them! 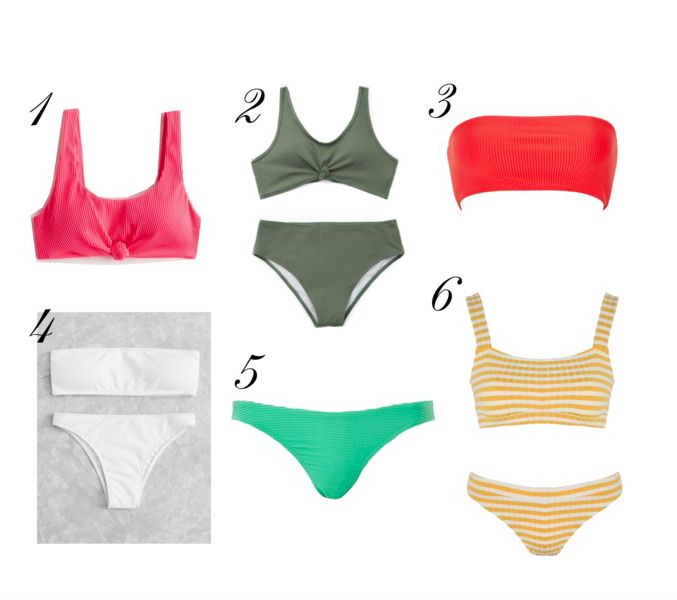 Keep reading to find some awesome bathing suits! 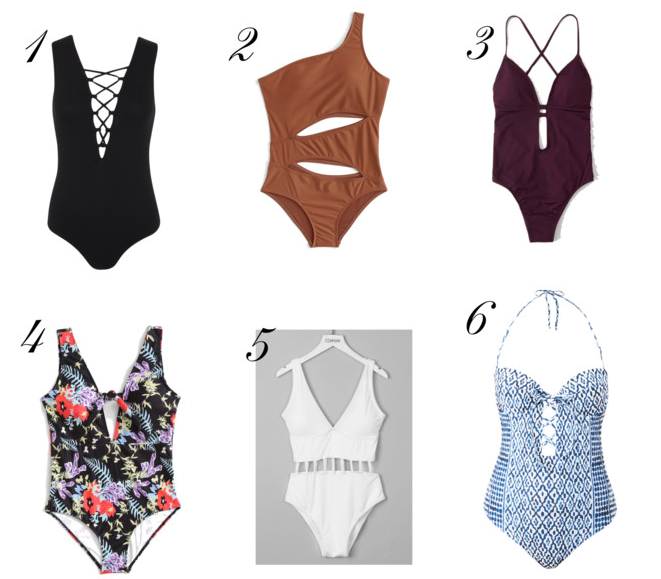 So, here are some super cute bathing suits to check out! Comment down below any of your faves or what trend you're looking forward to the most! Wow, ok. I literally just got home from my last final of high school. I am officially done. This is bizarre and even though I know I complained constantly about school and stress and tests and papers and presentations (I complained a lot), I can't help but feel sad. It's honestly a weird feeling because I am so incredibly excited for everything that is still coming up, but a massive part of my life is now over. I don't mean to be overly dramatic, our school does internships for the next 6 weeks, and I Prom, graduation, and tons of crazy nights with friends to still look forward to, but this is the first time it has really hit me that everything is ending and everything is changing. This was past week was the last time I'll be in one building walking from class to class, the last time I'll ever take a gym or french class, and one of the last times I'll be with all my friends in one place. So am I wishing for more time? I don't really know. Maybe. I'm not here trying to bring down the mood or make everyone sad, I'm just conflicted and want to remind everyone, whether you're a senior or not, to embrace every moment of high school or college or wherever you are in your life. It flies by. And one day, you might wish you hadn't willed it all away. So, this is where I've been recently. I know I haven't been as active on the blog or on instagram as I would like to, but I've been crazy busy and I'm trying not to miss out on anything. I'm really sorry if this came across as v sad, I wasn't trying to make it, I just needed a little bit of a brain dump to unpack all these lasts. As always, comment your thoughts down below, I'd love to hear them! Stress and anxiety are two things I struggle a lot with. I know a few months ago I posted a few ways to help de-stress, but today I wanted to come back to this topic. Today's post, though, is more focused on things you can actually do, like right exactly now, to help you de-stress. Do A (Simple) Chore - I find doing easy chores incredibly relaxing. Not only does it give you a set thing to think about, you'll also wind up feeling like you're accomplished something! Make your bed, throw in a load of laundry, or wash the dishes in the sink. These chores take no time but will make a world of difference. Do A Crossword - Lots of my friends and family do crossword puzzles religiously, so I recently started giving them a try. I'm not very good yet, but I do find them extremely relaxing. It ends up being a chance to just unplug and take your mind off all the craziness of life. If you're looking for some good ones, I recommend these, some are a challenge but not impossible. Color - Adult coloring books are an actual thing and I am extremely happy about this. And by adult coloring books, I mean more intricate designs not coloring books with ya know.... Ok I think you get what I mean so I'm going to stop talking. Anyways, I love just getting to sit, zone out, and color; it's so fun! Make A List - I am obsessed with list making; it's pretty much how I start and end every single day. My mom always says make a list of everything you need to do when you're feeling overwhelmed. This is a great way to stay grounded, but if you're not into that, try making any list, a bucket list, wishlist, to-watch/read list, etc. Ok, so here are 4 simple things you can do whenever you're feeling stressed. Let me know any other ideas you have down below, I'm sure we'd all love to hear them! Wow. It has been a while. I have continuously talked about having "a lot going on" in my life and taking weeks, if not months, off from posting. And I hate myself for it. I finally think I'm ready to talk about what has been going on. When I mentioned talking about this on the blog, most everyone told me that I shouldn't feel the need to. And I wouldn't talk about what I'm going to if I didn't think it would be relevant to anyone else. For the past few years, I have been struggling with depression. The depression has invaded my life in every way possible; schoolwork, hobbies, friends, family, and anything else you could imagine. This includes my physical health. Mental and physical health are interconnected, so with poor mental health came a lot of physical problems. For example I have chronic migraines (which has gotten MUCH better!) and chronic headaches. If you have ever had a splitting headache for extended periods of time, you know what I am talking about... I am not sharing because I want pity or attention, I want anyone else going through a mental health issue to know that YOU ARE NOT ALONE. There is ALWAYS someone you can talk to-- I go to my school psychologist, teachers, friends, parents (sometimes...), and professional help. I find that creating an amazing support system gets me through every day. I decided to write this today because something clicked inside me. I was walking into my physical education class when one of the teachers stopped me and said "you have such an infectious smile. You must get that a lot." I was shocked and replied, "nope. Nobody has ever told me that..." Thats when I realized that I really was changing and doing better. Obviously I am not changed, or better; I still came home from school and napped and avoided homework, but the fact that my intense RBF has started wearing off proves that I will, and CAN, get to a better place. Any of these 3 feelings are completely reasonable and valid. Speaking to point 3 more specifically, I want you to know that you are not alone, and that the best cure is to talk out your feelings. No matter how hard this is (I spent almost a year in therapy with hour long silent sessions because I wouldn't talk. I know how that is), it is ALWAYS worth the outcome. Please please please reach out to anyone who could help you (I'm always happy to insta DM people if they don't know who else to talk to). I actually have some more life updates to share with you because this has actually been pretty therapeutic, but I'll share them in another post to avoid boring you. Thank you so much for being patient with me and for reading this. Guys, I had SO much fun writing the first OG Youtube Hyped Products Post, and I ended up having way to many products for one list, that I thought I would share a part two! Does anyone else remember the depotting craze? The MAC Single Shadows were crazy popular but kind of annoying to cart around so then everyone started up with Z-Palettes and moving their MAC shadows from their cases into these palettes. The two colors that no one could live without were All That Glitters and Satin Taupe. Urban Decay Primer Potion was the go-to eyeshadow primer, and for a good reason. Yes, Urban Decay has since come out with tons of variations of this product, but I still stand by the original. And does anyone else remember when this was sold in an actual potion bottle? I clearly walking with Jordan to a crazy overpriced CVS to buy the Milani Luminoso Baked Blush. The color is gorgeous, and everyone used to use it as a "barely there" blush. The Revlon Colorstay Foundation was the budget foundation option but seemed to work wonders. This is still a really solid drugstore option even though I never hear anyone talk about it anymore. The Maybelline Tattoo Cream Eyeshadows were another low-budget option that everyone loved. I still have a container filled with tons of these! One of my all time favorite blog memories was Jordan reviewing one these and writing "This was hairy. K bye". Iconic. If you had any hope of following a tutorial exactly, you better have had the 88 Shade Coastal Scents Palette. These things were giant, but everyone wanted them! I never saw a need to buy one because I would never use all the colors, but I loved looking at them. The brand NUME used to work with tons of beauty gurus (even us, way back when), so the NUME curling wand was everywhere! I actually never purchased one, but I still kind of wish I had. And these two posts wouldn't be complete without a mention of two of my favorite OG beauty gurus. Elle and Blair Fowler (@allthatglitters21 and @juicystar07) were the two youtubers who really got me into makeup and I just wanted to give them both a quick shoutout! Blair is still making videos so don't forget to check her out, and Elle is 20-something weeks pregnant right now, so we wish her the best of luck as a mom-to-be!